Learn more about the work Victoria Natural History Society members have undertaken to share nature and conserve it. Free Nature Programs for Children! We know schools are struggling with budgets, and we are here to help. We recognize the importance of involving school-aged children in activities and events that expose them to the incredible diversity of the natural world. Our goal is to instil a sense of wonder and a respect for nature through outdoor experiences with living organisms. 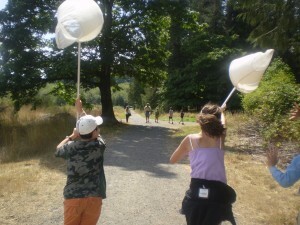 To accomplish this, the Victoria Natural History Society provides, free of charge, volunteer naturalists to accompany school classes on field trips into nearby green-spaces. Two volunteer coordinators handle all the requests that come in and they organize our team of experienced volunteers who are knowledgeable in a wide variety of fields. To request a Naturalist for a presentation or to accompany your class on a field trip, fill out this online form or send an email to schoolprograms@vicnhs.bc.ca. Please give us at least two weeks notice. Any other comments or special requests?